Monday July 4th 1898 We got our work done and started up town. The relatives all with their dinners to Aunt Ems and we had such a good time. I walked over home to help Mother with making coffee for a lot of the friends who were coming over there to see the fire works. The Whetstones were all to stop at Ashleys and were back again for supper. There were a great many over to see the fire works. Will and I stayed all night. a grand day. 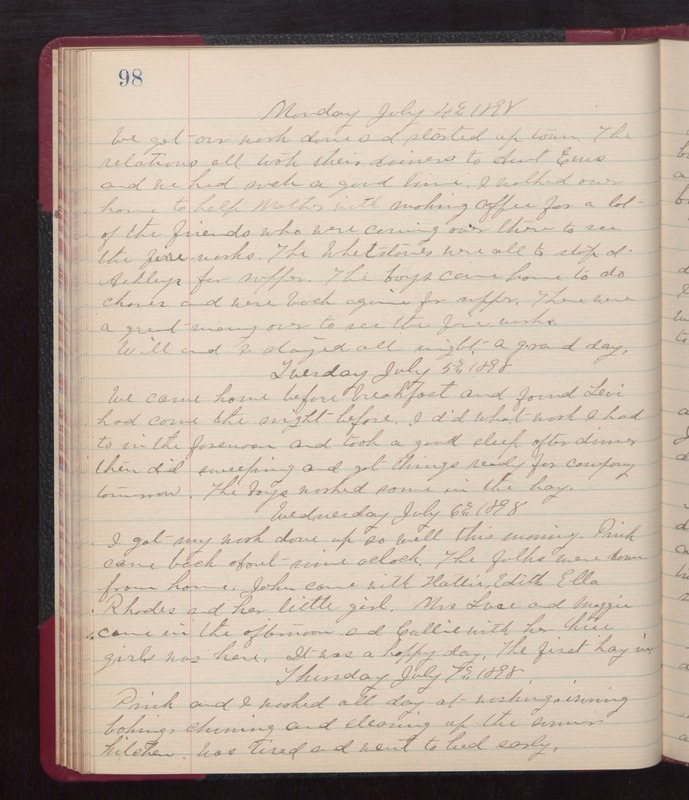 Tuesday July 5th 1898 We came home before breakfast and found Levi had come the night before. I did what work I had to in the forenoon and took a good sleep after dinner then did sweeping and got things ready for company tomorrow. The boys worked some in the hay. Wednesday July 6th 1898 I got my work down up so well this morning. Pink came back about nine oclock. The folks were down from home. John came with Hattis, Edith, Ella Rhodes and her little girl. Mrs Luce and Maggie came in the afternoon and Callie with her three girls was here. It was a happy day. The first hay in. Thursday July 7th 1898 Pink and I worked all day at washing, ironing, baking, churning and cleaning up the summer kitchen. Was tired and went to bed early.